Golf in Winter? I don’t know about you, but when the temps drop below 40 degrees (fahrenheit) I don’t even think about trotting out to the golf course or driving range. I know some golfers love the cold. They bundle up tight, put hand warmers in their gloves, stuff toe warmers in their snow boots and earmuffs over their ears. But how they can swing a club wrapped up like a bug in a rug is beyond me. Not only that, but icy cold golf balls bounce all over the place. You can’t control the ball very well. 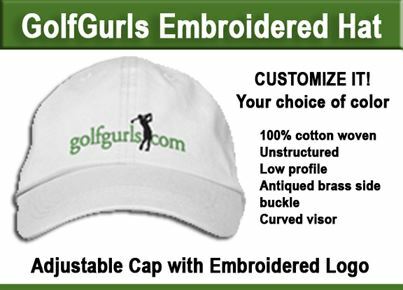 And you can’t submit a golf score to the GHIN site if you play winter golf in the northeast! So how can you practice when it’s too cold to play outdoors? Find a place in your house with high ceilings and not too much furniture and swing a weighted training club like the Orange Whip. 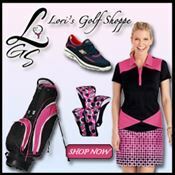 Ten or fifteen minutes a day will imitate your swinging your way through 18 holes. (I have an Orange Whip. It works well but, unfortunately I live in a house with very low ceilings… so have to swing in the backyard. Not fun in freezing weather.) Check out the video with Five Minute Drills you can try using the Orange Whip. Set up a spot in your living room where you can practice putting. This is something I’m working on. It’s not perfect and the floor is not a putting green. But it does help with practicing your putting stroke and getting the alignment of the putter face and ball to make good contact. I have one of those automatic putting cup return gizmos. 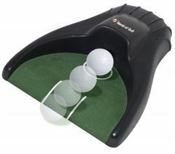 Putt into the cup and the ball comes flying back at you. (Be sure to set the return switch to slow or you’ll be dodging bullets.) Want to step it up a bit? I just heard about this putting mat from Martin Chuck, one of the top instructors on the net. It’s called the Well Putt Putting Mat. It’s 10′ long and is designed with graphic markers to improve your alignment, pace and distance. 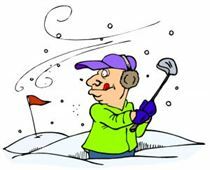 If you’re one of the lucky golfers who heads to warmer climates when the snow and ice cover the local course, good for you! Get out there and keep swinging. But if you are stuck in northern climes by work, family or you just love the winter, keep your game tuned up with one of these products to help you drill through the off season! How do you practice in the off season? Do you have a favorite drill? or product you can recommend? Share your ideas in the space below. I live in Michigan and have 5 or 6 months every year when I cannot play outdoors. I play in a tournament early in the season so I have to keep swinging all winter or I totally lose it. I think the Orange Whip sounds like a good product. I will check it out. Thanks.